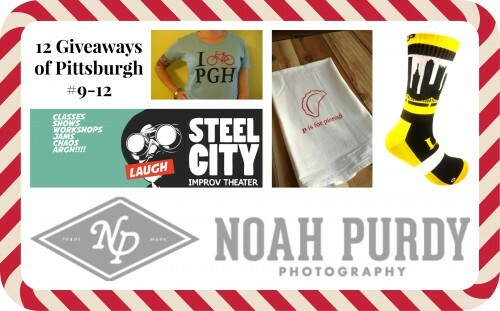 I’m thrilled to post the last four items for the 12 Giveaways of Pittsburgh! It has been so much fun to write about these businesses and share these items with you. As I put this list together, I realizes that almost all of the owners of the businesses featured on this list I have met and become friends with because of IheartPGH. Pittsburgh is filled with some amazing small business owners and I feel incredibly lucky to have the opportunity to get to know these folks and share their businesses with the readers of IheartPGH. We’re keeping all of the giveaways open until the end of the week – so you still have time to enter. We’ve been working with several other bloggers to help Community Human Services raise money to provide small holiday gifts to the folks that they serve. We still need to raise $1000 to make sure they are able to provide holiday gifts this Christmas. Anyone who donates gets extra entries for the giveaways and a chance to win the great hockey tickets for the Penguins game on January 15, 2014. #9. A Level-1 Improv Class at Steel City Improv ($249 value) – if you’ve ever wanted to learn to make people laugh – this is your chance! #10. A Portrait Session from Noah Purdy Photography Noah is an incredible photographer, who also donates his time to help CHS – check out his blog post about Pittsburgh Help Portrait here. #11. A Pair of Pittsburgh socks from LineUp – because every Pittsburger should show their steel city pride on their feet. #12. A $50 Gift Certificate from Garbella – Amy makes some of our favorite Pittsburgh t-shirts. What can we say we’re partial to anything with a pierogi on it. Amy screenprints all of her items by hand, here in Pittsburgh. Enter to win one of these via the Rafflecopter widget below! If you want to just contribute to CHS you can do that here.